An avid thinker and planner, Satya has always been deeply passionate about helping clients build innovative technology solutions and believes in delivering more than what is expected. Before embarking on his entrepreneurial journey, Satya worked with Infosys for more than a decade as a project manager helping several fortune 500 companies by delivering technology-oriented solutions. Over time, he started to mull the idea of using that experience in starting his own company. 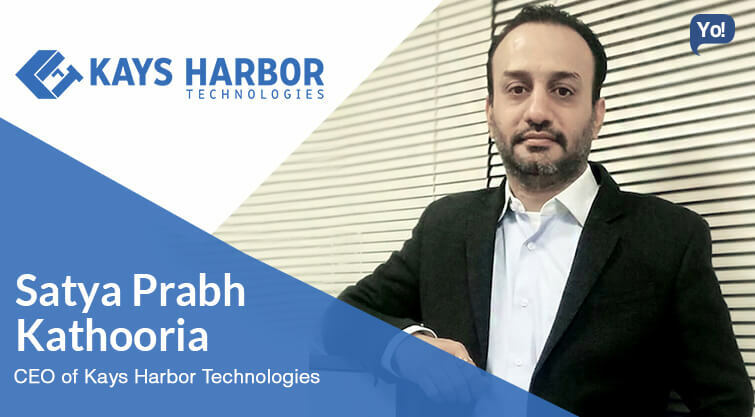 This is when Kays Harbor Technologies came into existence, with a single focus to help businesses unlock maximum potential of information technology. He often spends his time mentoring, training and actively communicating with his employees with a goal to build an employee owned, process driven work environment. Satya is a true people’s person; he strikes an instant rapport with clients and employees alike and is genuinely interested in helping others. Kays Harbor Technologies is an IT consulting and services organization helping enterprises, small businesses and entrepreneurs leverage the power of custom software solutions. We, as a software consultancy firm, help clients translate their business needs into right technology solutions, which are flexible and scalable as per their evolving business needs. We started with Healthcare domain as our focus area and ventured out as we grew and matured. From telemedicine to EMR solutions to B2B commerce portals to real-time vehicle dispatch solutions, we have done some exciting work across multiple business domains. I believe the primary motivation was to make a positive change to the lives of people around me, and Kays Harbor happened to be a means to achieve this objective. “Say what you mean, do what you say” I believe in maintaining open, clear and transparent communication with everyone, both in my personal as well as professional life. In fact, you will find this philosophy very much ingrained in the culture here at Kays Harbor. It helps us build an environment of respect and trust, both with our employees as well as clients. We sincerely believe it to be a base for a long term relationship. The most challenging part of our journey was to zero down on our priorities and choosing between rapid growth and a process-driven culture. While we scaled very fast and had good traction for our services, very soon we realized that we need to be structured and process oriented if we have to play a larger game and wow our clients with our service. At the same time, we need to find clients who share the same mindset. The hard thing about this approach is that you reject more business than what you accept, which is very scary in the short term. However, it reaps huge benefits for us in the long term, especially in terms of client satisfaction and repeatability. We pivoted with our processes and methodologies to identify what works for us, and deliberately kept our heads low and moved slowly till we were sure that we are ready to embrace scale. We had to fine tune our entire approach and mindset of customer servicing, and focus on clients where we thought we can add sustainably and continuous value rather than building just transactional relationships. Those were hard days where we had to intentionally let go some of the prospective clients because we wanted to focus more on long-term engagements and let go off the short term ones. Someone may call it a bad business decision, but for our stability took precedence over the scale. We are 3 co-founders at Kays Harbor and have completely bootstrapped the company till date. We have intentionally grown slowly in our initial years since we wanted to establish a stable business model, backed by rock solid processes and systems. “Train people well enough so they can leave, treat them well enough so they don’t want to” I believe it’s not just the paycheck which people are always looking out for; it’s also about the work and the workplace culture. At Kays Harbor, it’s our endeavor to treat every employee with utmost respect and acknowledge the strengths they bring to the table, at the same time keeping them motivated enough with challenging work and enough learning opportunities. We have always been keen to nurture a culture of honesty, integrity, ethics and deep moral values; and most importantly sustaining it. We strongly believe that only the people who have similar kind of values can absorb themselves in the culture and act as catalysts to pass it on to the next levels. That’s one reason we have a very stringent recruitment process involving multiple rounds of discussions to understand if the candidate’s values are in harmony with the values of the organization. No doubt we look out for technical expertise, we also lay a deep emphasis on cultural fitment. I believe it’s our culture which helps us retain our people. Focus on one thing at a time and do them well. I used to multitask a lot. I literally had to make a deliberate attempt to stop doing that. Initially, multitasking appears to make you more productive but slowly you realize you are not doing justice to the tasks. When you start, you get involved in each and every decision of the organization. However, as you scale and grow, you need to resist the urge of getting involved in everything and need to delegate so that you can focus more at the strategic level. That is one thing, which I believe I need to do more than what I currently do. Never stop learning. Continue to invest in your knowledge. It comes back with many dividends. Avoid the urge to achieve success overnight. Don’t be rash. Rome was not built in a day. Invest time and energy in the basics and make smart and thoughtful moves as you scale. Keep your life simple. It’s easier said than done. But if one is able to achieve that, nothing will bother you. We are planning to expand our headcount to 150 (from current 50+) by the end of 2016. The plan is to expand our service offerings as well as a client base, both in terms of numbers and geographies in next 3 years. If given a chance to start my career again, I would spend more years studying before I start working. Maybe I would do a Ph.D.
You may find my answer quite unconventional but I am not a person who loves traveling a lot. I love being at home with my family. Right now, I get very less time to do that. If given a chance, my home will be my top getaway destination.